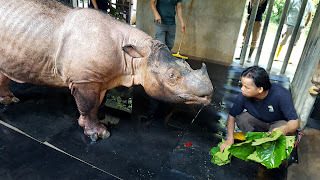 The demise of Puntung, one of the last three remaining Sumatran rhinoceroses (June 4), united the nation in our grief. Just weeks later, the tragic and avoidable death of a baby elephant by a speeding vehicle on the Gerik-Jeli Highway (June 19) left both the public and the conservation community dismayed and horrified. Photos that surfaced on social media in the same month (June 5) of the hunting and killing of protected and endangered species including the Malayan sun bear, ostensibly by indigenous hunters, are a further indication of the grave threats faced by Malaysian wildlife. It looks as though the future for wildlife in Malaysia is very bleak indeed, and that extinction is a certainty for many species. Human behavioural change is essential to stopping wildlife trade and preventing extinction. As a direct result of poaching and habitat loss, there are only 2 Sumatran rhinoceros left in Malaysia following Puntung’s death. In order for anti-poaching and anti-wildlife trafficking laws to succeed, there must be public education and awareness efforts to encourage and reward wildlife crime reporting, eradicate bribery and corruption, and discourage the hunting, trafficking, sale, and consumption of wildlife. The power of social media must be harnessed to expose, report, identify and prosecute wildlife offenders, and to educate society that traditional medicine relying on wildlife parts such as rhinoceros horn and pangolin scales are a fraud and harmful both to wildlife populations and human safety and health. Whether or not we are in the medical or conservation communities, we must make it clear to everyone including other social media users, indigenous communities and the older generation who make up the majority of traditional Chinese medicine consumers that there are no benefits to consuming wildlife parts, and there is no such thing as legal or sustainable trade in wildlife. The hunting of wildlife by indigenous communities is a sensitive issue, and prosecuting indigenous hunters may be viewed as an oppressive act that impinges on indigenous rights. However, it cannot be denied that many indigenous hunters capture or kill wildlife for commercial gain, and the absence of arrests and prosecution will only embolden poachers and hunters to act with impunity. Some of the hunters may already be aware that the hunting and death rates have already exceeded the natural reproduction and growth rates of certain species, yet yield to the temptation of making a quick gain. We cannot ignore the human factor in wildlife protection, and as such, must participate in and contribute to efforts and initiatives to empower and provide alternative and sustainable livelihoods for rural and indigenous communities to reduce and eventually eliminate their need for poaching and hunting. Environmentalists have consistently objected to the construction of new highways through forests and wildlife habitats, knowing the adverse ecological effects. In situations where such infrastructure already exists, there must be systems put in place to mitigate harm to natural areas and wildlife. • Installing speed cameras and enforcing speed limits in wildlife-rich areas. The existence of wildlife protection laws alone will not ensure the survival of wildlife. It is incumbent upon all of us to take steps and modify our attitudes and behaviour to reduce wildlife deaths, failing which we will have to bear the detrimental environmental, economic and social consequences of an ecologically imbalanced and impoverished world.